The Governors Highway Safety Association (GHSA) reports that pedestrians account for the largest proportion of traffic fatalities recorded in the past 25 years. Florida has the distinction of being a top state with the worst drivers in the nation, but did you know Florida also has the second most pedestrian deaths per capita in the United States? That means 3.12 pedestrians died out of 100,000 pedestrians in Florida. Palm Beach, Broward and Miami-Dade Counties continue to have the highest pedestrian crashes and fatalities in the state. Pedestrian accidents are preventable. Accidents often involve cars, trucks, motorcycles, bicycles, buses, or trains. While drivers are legally responsible for controlling their vehicles and for following the rules of the road, they are often the cause of most crashes; however, some accidents may be the result of the pedestrian’s actions. The elderly and children are at greatest risk. Some often overlooked causes can include parking lot defects, construction zones or work zone areas, and even poor landscaping. 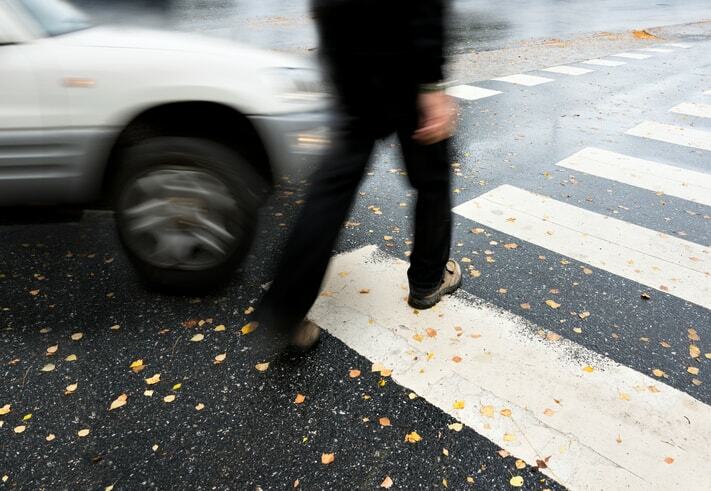 Pedestrian accidents are often serious and even fatal. Injuries can include bruises, cuts, broken bones, amputations, spinal cord injuries, brain injuries, and dental injuries. If a motorist operates their vehicle carelessly and an accident occurs, the motorist can be held liable for expenses associated with a person’s injuries resulting from the accident. An experienced attorney will help you determine negligence and liability. Determining liability can be a complicated matter, especially if more than one party shares in the responsibility. An attorney will also look at the available insurance coverage including Personal Injury Protection (PIP) benefits, (BI) Bodily injury coverage and Uninsured/Under-Insured Motorist (UM/UIM) benefits or any other additional policies of insurance. While cities across the country look to reduce pedestrian accidents by improving lighting, traffic signals, adding crosswalk countdown signals, adding medians, barriers and speedbumps, and launching green streets and educational programs like Share the Road and Complete streets – drivers and pedestrians still have a responsibility to pay attention, follow the laws, and to remove distractions. Some additional safety tips for drivers include focusing on driving, putting down phones, using mirrors, driving the speed limit, using signals, do not drink and drive, and driving defensively. Some safety tips for pedestrians include wear bright clothing, look both ways before crossing the street, make eye contact with the vehicle driver before crossing road, use crosswalks, stay on the sidewalk, beware of parked vehicles, put your phone away, do not drink and walk, and walk defensively. If you have been seriously injured in a pedestrian accident, or have lost a loved one as a result of a pedestrian accident, contact trial attorney Tami Wolfe online for a FREE consultation or call her at (954) 791-0477.